The ISO 27001:2013 standard specifies requirements for establishment, implementation, maintenance and continual improvement of an Information security management system. 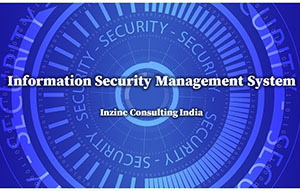 The expert ISO 27001 consultants in India (ISMS consultants in India) of the Inzinc Team will ensure in providing professional consultancy solutions that puts a solid ISMS foundation. An Information security management system (ISMS) is the part of an organization's management system that consists of a set of policies, objectives and procedures to ensure that the organization's information is kept secure, to manage & minimize the risk and ensure business continuity by pro-actively minimizing the impact of a security breach. What does our ISO 27001 Consulting services include? Documentation of ISMS Manual (ISO 27001 manual), ISMS procedures, ISMS policies (including ISO 27001 security policy), forms & formats. Our ISMS consultants will use the professional ISO 27001 documentation toolkit to cover the ISO 27001 documentation requirements of the ISO 27001:2013 standard. ISO 27001 Internal auditor training and help conduct ISO 27001 Internal audit and help conduct ISO 27001 Management Review. Our ISO 27001 consultants in India (Bengaluru) India will ensure that the above ISO 27001 consulting services in India are executed with dedication and in a timely fashion. Our ISO 27001 Consultants in India make sure that the ISO 27001 implementation helps you to effectively establish, monitor and continually improve the Information Security Management System. Provides a framework to ensure safety of sensitive information. Builds trust and confidence among customers and stakeholders on how risk management is carried out. Ensures the secure exchange of information. The exposure to risk is minimized. Helps in developing a security culture that gets embedded in the organization culture. Helps to protect the Organization's assets, customers and stakeholders. Gives the competitive edge compared to non-ISMS based companies. Customer satisfaction and perhaps delight ! Organizations who are certified to ISO 27001:2005 need transition to ISO 27001:2013 which is the latest version. Inzinc provides ISO 27001 consultancy services in India to enable smooth transition from the 2005 version to the 2013 version. Move towards integration of all future ISO standards which will have 10 clauses with common clause headings across ISO standards but with content pertinent to the management standard in context. This paves way for easy Integrated Management Systems. Connect the ISO/IEC 27001:2013 standard to the risk management standard ISO 31000:2009. In terms of ISMS controls, the ISO/IEC 27001:2005 Version had 133 controls classified under 11 domains. The New ISO/IEC 27001:2013 Version consists of 114 Controls classified under 14 domains. Refer Annex A of the ISO 27001:2013 standard for ISO 27001 domains. In terms of the management clauses, the ISO/IEC 27001:2005 had eight main clauses. The new ISO 27001:2013 Information security management system standard brings up the context of the organization into picture. This is linked to the ISO 31000 risk management standard. Here we define internal context (internal issues) and external context (external issues). Another change is that the Section on PDCA cycle is removed. However, the PDCA cycle can be used as one of the tools of Continual Improvement and can be used in the processes. Also, the clause 9.3 on Management Review specifies requirements on the topics for consideration during the review instead of specific inputs and outputs of the management review as put forward in the earlier ISO 27001 standard. So, please contact our ISO 27001 consultants in India for transition from (upgradation from) ISO 27001: 2005 to ISO 27001: 2013. We have experienced Lead auditors and information security consultants. We can depute our team for requirements of ISO 27001 Consultants in Dubai / Abu Dhabi in the UAE, ISO 27001 Consultants in Singapore, ISO 27001 Consultants in Kuwait, ISO 27001 Consultants in Mauritius, ISO 27001 Consultants in Maldives, and ISO 27001 Consultants in other parts of the World including UK, Australia, Canada, etc. As part of the ISO 27001 effectiveness measurement, our ISO 27001 consultants in India can conduct ISO 27001 Internal Audit on behalf of our clients. Through our rich experienced ISO 27001 consultants in India we can provide ISO 27001 Internal Audit services in India. Our committed team of ISO 27001 Consultants in India will help conduct the Internal Audits on behalf of our clients and we will submit reports of the Internal Audit.